Megaflo subsoil drainage is a stiff high flow pace panel drainage system that is specifically designed for road side and for use in sports fields. It works rapidly than any other drainage system in order to protect pavements against any kind of structural damage. The Megaflo subsoil drainage only requires a narrow trench and this way we can reduce the installation cost. Wall tag is a leading supplier of Megaflo subsoil drainage and Megaflo drainage pipe in Singapore with a vast service and support network availability. Kindly contact us for Quotation. Megaflo® panel drain provides the dimensional stability and field-proven structural strength for quick, effective subsurface drainage. Megaflo® consists of a perforated HDPE core wrapped with nonwoven geotextile to prevent soil ingress into the drainage system. Performance is the distinguishing feature of the panel drain due to its ability to rapidly collect and remove water. Compared to round pipe, Megaflo® has twice the inflow capacity for an equivalent length and will drain water in less than 60% of the response time. Its slim profile permits faster and more cost effective installation in a narrower trench. The design of the Megaflo® panel drain permits signficantly higher flow velocity at lower head. 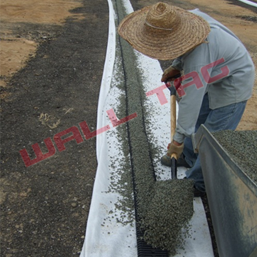 Wall Tag supplies Subsoil Drainage material in Singapore. Kindly Contact us for quotation. Copyright © 2019. Wall Tag Pte Ltd. All Rights Reserved. Website by Creative eWorld Pte Ltd. Additional Info. Sitemap.